Straight leg raises: While lying on your back, bend one knee so your foot is flat on the floor. Keep the other leg straight and lift it a few inches off the floor. Hold the position for a few seconds and bring the leg back down. Leg curls: While lying on your stomach, slowly curl your leg to bring your heel close to your buttocks. The exercise can also be done while standing on one foot. Simply bring the heel of your other foot up behind you and try to touch your buttocks. Hold the position for a few seconds and then place your foot back down. Leg extensions: Sit on the floor with your legs out in front of you. Place a large foam roller or football under one knee. Contract the quadriceps muscles above the knee to straighten the leg lifting your heel off the floor. 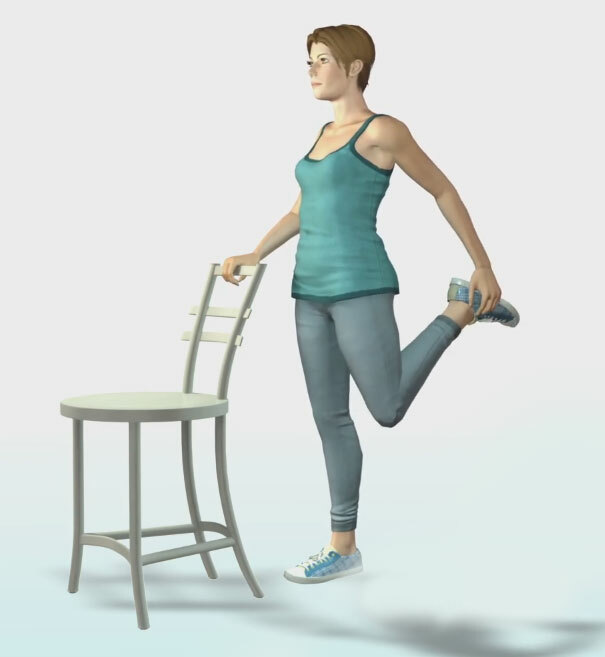 Hold the position for a few seconds and slowly relax the quadriceps muscle to let your heel return to the floor. Wall squats: From a standing position with your back against a wall, slide your back down the wall until your thighs are parallel to the floor. Hold the position for a couple of seconds and return to the starting position. Step-Ups: Place one foot on a platform or step in front of you. Step up on the platform and bring your other leg up as well to lightly touch the platform. Then step back down and repeat the movement with the other leg. Do 10-15 repetitions every day of each movement. As your strength improves, you can even try adding light ankle weights to increase the intensity of your workouts and further strengthen your knees. These exercises are designed to improve knee function so you can move better. A bit of muscle soreness after your workout is to be expected, but if you experience any sharp pain, you should stop your activity and consult your doctor as soon as possible. Dr. Ronak Patel is a Board-Certified Orthopedic Surgeon offering a full range of care for all problems of the knee and shoulder with a special interest in complex knee disorders.Book your appointment with Dr. Patel today. For all appointments and inquiries, please call (630) 929-2249.